Sherwood Gardens is located in Northern Baltimore, one block east of the 4100 block of St. Paul Street. Turn east onto East Highfield Road to reach the gardens. 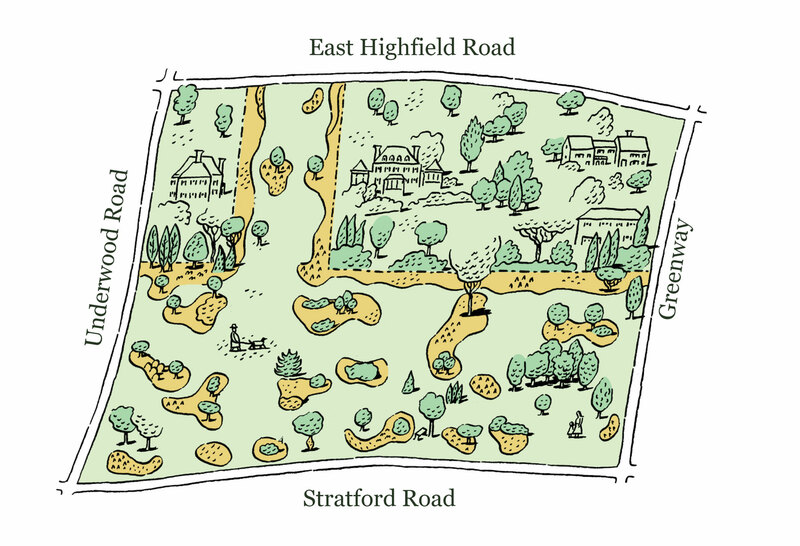 The gardens are bounded by East Highfield Road, Underwood Road, Stratford Road and Greenway. 2 hour residential street parking is available on the streets surrounding Sherwood Gardens. 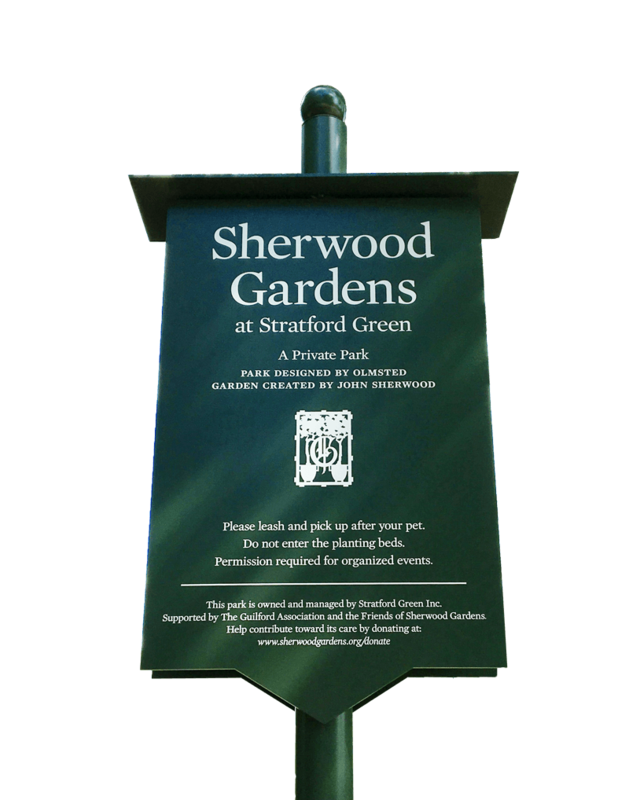 Yes – Dogs are allowed in Sherwood Gardens but must be kept on a leash at all times. Please note that there are no trash receptacles or pet waste stations located within the park. We also ask that pet owners use discretion in bringing their dogs to the gardens during peak tulip bloom because of the number of visitors. Yes – admission to the gardens is free but we do hope you will consider making a donation. Most visitors do not realize that there is no public funding for Sherwood Gardens. The tulips, flowers of summer, perennials, care of the majestic trees and park maintenance depend entirely on annual donations and volunteers. When is peak tulip bloom? Typically peak bloom occurs the last week of April through the first week in May depending on weather conditions. Are there public restrooms available? No – there are no public restrooms located within Sherwood Gardens. Are the gardens Stroller/Bicycle/Wheelchair accessible? Please note that Sherwood Gardens does not have any paved pathways or trails. The closest bus stop to Sherwood Gardens is on North Charles Street (approximately 3 blocks away). Can we have a picnic on the lawn? Yes – picnics are allowed on the park’s lawn, but please note that there are no trash receptacles on the park property, there are no public restrooms within the garden, and gatherings of more than 15 people must obtain prior permission from the Guilford Association office by calling 410-889-1717. Can I host an event at Sherwood Gardens? Gatherings of more than 15 people must have prior approval. For additional information – view our event guidelines. Inquiries about the use of the Gardens should be made to the Guilford Association office by calling 410-889-1717. May I use the gardens for commercial purposes? Over the years we’ve noticed an increase in the number of park visitors using the gardens as a backdrop for video production, photography tours, .etc. Because these commercial activities can be disruptive to other visitors and can interfere with the tranquil, residential nature of the gardens we do not allow the private park to be used for commercial purposes without prior approval. Inquiries about the use of the Gardens should be made to the Guilford Association office by calling 410-889-1717. Sherwood Gardens does not currently offer guided tours.